Slice stems from jalapeno peppers, cut a long slit into the sides, and remove seeds from peppers. Sprinkle chicken tenderloin pieces with seasoned salt and garlic powder. Place a piece of chicken into the hollow of each pepper; top with an onion wedge. Wrap pepper completely in bacon and secure with toothpicks. Repeat with remaining peppers, chicken, onion, and bacon. 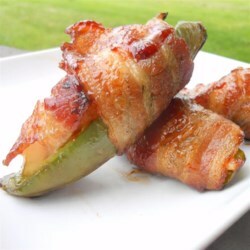 Grill bacon-wrapped peppers on the preheated grill until chicken tenderloin is no longer pink, the juices run clear, the pepper is tender, and the bacon is crisp, about 15 minutes. Flip peppers occasionally during cooking. An instant-read meat thermometer inserted into the chicken in a pepper should read at least 160 degrees F (70 degrees C).